Keep warm during the winter months with this 5200 BTU portable infrared space heater from Heat Storm. This Sahara Model Space Heater boasts a heat exchanger in the unit which converts the cool air and moisture in the room to a soft, moist, safe heat without reducing oxygen or humidity. Heater boasts an air purification function due to the high efficiency lifetime filter. The LED display shows the room temperature and not the set temperature, and you can adjust how much heat the unit puts out with the included variable remote. 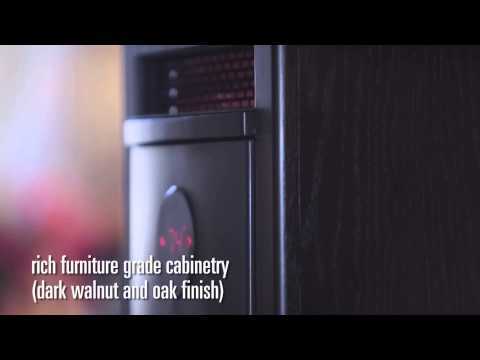 Heat up to 1000 square feet of any room with this sealed space heater. Heat Storm Infrared Heaters use high quality silica quartz seals on an inner tungsten filament to prevent oxidation and ensure long life. This air tight seal protects the filament from air and water molecules, as well as dust, lint, and other particulates. Heat Storm believes that world class heat should not be limited to heavy box-shaped heaters.